Warmer, deeper and more stripped back than their previous record, ‘Made In the Dark’, ‘One Life Stand’ is still conscientiously crafted and informed by the kind of intelligent evaluation that is now second nature. The seductive and surprisingly glossy finish they can deliver when the mood takes them and the song demands are replaced with an emotional honesty and an open-hearted optimism that is disarming and often unexpectedly affecting. With both feet in the Jack Track underground roots of classic house and techno, and a heart in candid song-writerly craft, this record, in its entirety, is convincingly inspired by Joe Smooth, Marshall Jefferson, Derrick May, Theo Parrish, Bill Withers and Bill Callahan all at once. ‘One Life Stand’ seeps through to your soul while defiantly striking a pose (albeit in a jumper and glasses) in the middle of the dance floor called Now! 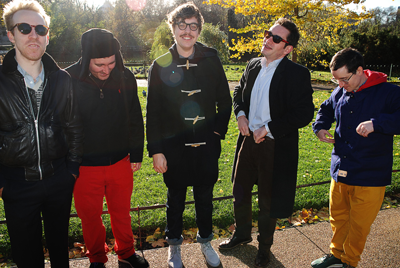 “We never have any plan when we record”, says Joe Goddard, one half, along with Alexis Taylor, of a core duo that have had the name Hot Chip since they played Pavement and Spacemen 3 covers at Elliott School, Putney where they first met in their early teens. “Things happen and we try to follow the thread wherever it leads. People might be surprised by a song like ‘I Feel Better’ coming from us. It’s kind of a big, commercial song that came from nowhere. We decided to embrace that instead of discarding it on this album." But even this accidental towering Euro classic just waiting for a Robyn or a David Guetta to add shimmering synths and perform it on some glittering music awards show from Dubai- isn’t enough to drag the whole thing in one direction. There’s still one of those gorgeous ballads that make you feel like you’re looking though a gap in Alexis’ curtains as he emotes almost privately on the ironically titled Slush (a recent collaboration with Robert Wyatt was inspired and makes perfect sense when you hear this). Songs from Joe like ‘Brothers’ and the beautifully naive ‘Alley Cats’ seem to move closer to Alexis’ instinctively candid style. Gospel-inspired arms-aloft future house classics like ‘Hand Me Down Your Love’ arm-wrestle with the spooky bass-line heavy Detroit influenced disturbance that is ‘Take It In’- something which might have Jeff Mills wondering why he’d never thought of putting something whistle-able on top of his brooding psychosis. ‘One Life Stand’ is brimming with the easy eclecticism we have come to expect- absorb if you will, the idea of avant icon Charles Hayward of This Heat making like Marshall Jefferson’s 909 machines on real drums. Still, uniquely, Hot Chip remain upliftingly accessible.